VINTAGE COSTUME ANTIQUE ESTATE JEWELRY BROOCHES AND PINS! 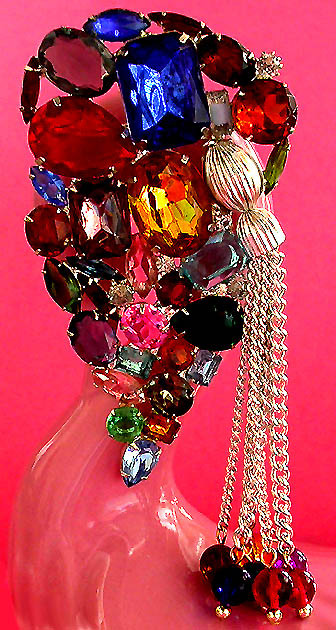 Huge Multicolor Crystal Rhinestone Vintage Silvertone Brooch Pin With Dangle Tassel And Glass Beads For Weddings, Proms, Pageants And Parties! 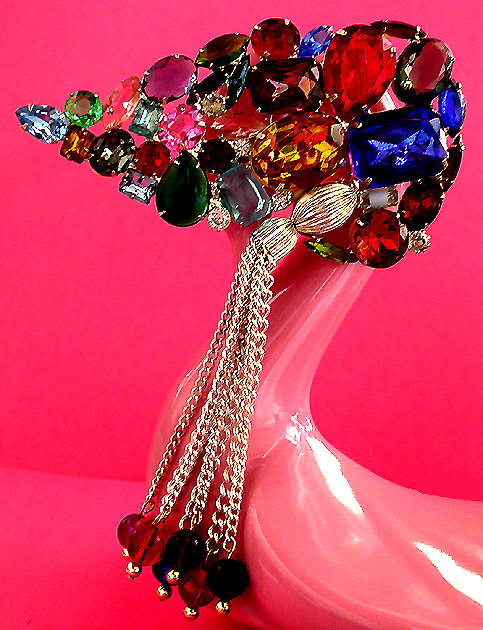 Item #P168101 - Huge Multicolor Crystal Rhinestone Vintage Silvertone Brooch Pin With Dangle Tassel And Glass Beads. Size: Width 4 1/2" x Length 2 1/2" + 3 1/2" tassel. Absolutely stunning! This huge brooch truly takes your breath away! If you adore large brooches and huge stones, this is it! This magnificent vintage brooch has it all! It has all shapes and sizes of sparkling crystal rhinestones and cabochons, any gorgeous color you can think of - rich emerald green, deep ruby red, sapphire blue, amethyst purple and golden amber, just a name a few, plus dangling a tassel for movement accented by round reflective colorful glass beads! The largest Sapphire blue princess cut sparkling crystal rhinestone, rich deep glittering ruby red teardrop crystal rhinestone and dazzling oval cut citrine crystal rhinestone measure a whopping 1" x 5/8" each! All these spectacular stones are individually prong set into silvertone metal. Profoundly beautiful and unusual! Excellent condition. A fabulous brooch pin to wear at weddings, prom nights, pageants, parties, cruises and special functions! Price US$198.00. SOLD.